’Tis the season of eating onions charred over live fire… In a previous post, we talked about the best places around Barcelona to find a calçotada. Yet, in a quarter century of at least one or two calçotades a year, I probably only have ever had 2-3 in a restaurant. Funny thing was that I would just order off the regular menu while the rest of the party would eat the calçotada menu, like I was purposely avoiding it. More about this later. From humble beginnings in the “Golden Triangle” of Valls, Reus and Tarragona, the tradition has now spread through most of Catalonia, in restaurants, and more important, at home. It has even reached further afield with calçotades available in Madrid, London or Rotterdam; even Anthony Bourdain featured a calçotada on his “No Reservations” tv show. A dear friend went as far as to throw a big calçotada party for all his friends in Orange County, USA to celebrate his 50th birthday! Nowadays, every company, social club or group of friends worth its salt has its yearly calçotada – the social aspects of the calçotada are key to its success – if you are a new arrival in Catalonia, no doubt you’ll get an invite to a calçotada – go for it! 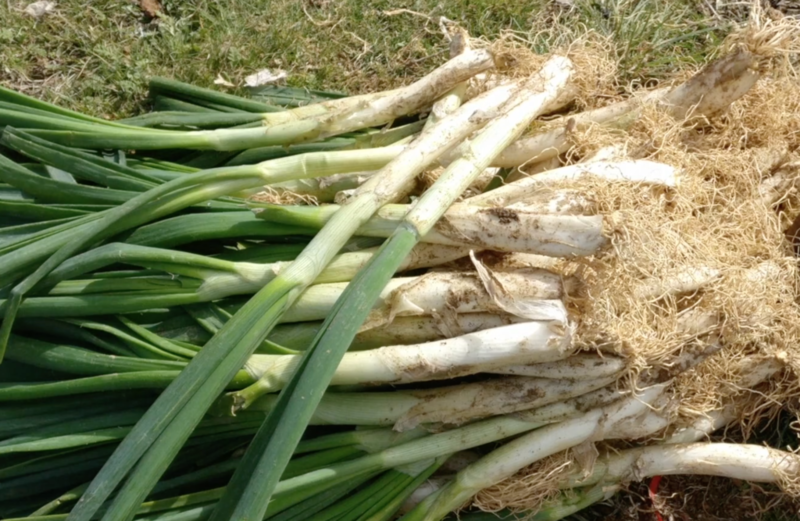 Back to the real calçotada, the homemade – the feast lends itself quite well to doing it at home in an outdoor setting. First time I was ever invited for a calçotada, it was in Sitges at the home of my parent’s friends, and it was a friend of theirs from Valls who came over as the expert – an early sign that the ritual was expanding outside its homeland. He brought the equipment, a large reversible grill with different length legs allowing the grill to be higher for flaming the calçots and lower for grilling meat over coals. However, the most important bit of kit that he brought along was the recipe for the sauce: salsa de calçots. Any veteran will tell you it’s the heart and soul of the calçotada, getting it right is an art, too runny and it doesn’t stick to the calçots, too thick and it takes forever to dip. Starting from the basics of almonds and hazelnuts, roasted tomato, raw and roasted garlic and nyora (a type of slightly hot pepper), each chef adds their own touch, and the recipe becomes a closely guarded secret. Just last week, with a group of friends we had a calçotada out in the country, very near my hometown of Artesa de Segre, just under the village of Montsonís with its castle looming over us. It was a perfect spring day, kids roaming freely all over the fields, making friends with random dog who just appeared, adults poking fun at a neighbour who was air-drying her multi-coloured thongs, and of course, grilling those calçots on a very original barbecue pit. It was a perfect day, but I still couldn’t get Agnès to tell me the (secret) recipe for the salsa de calçots. 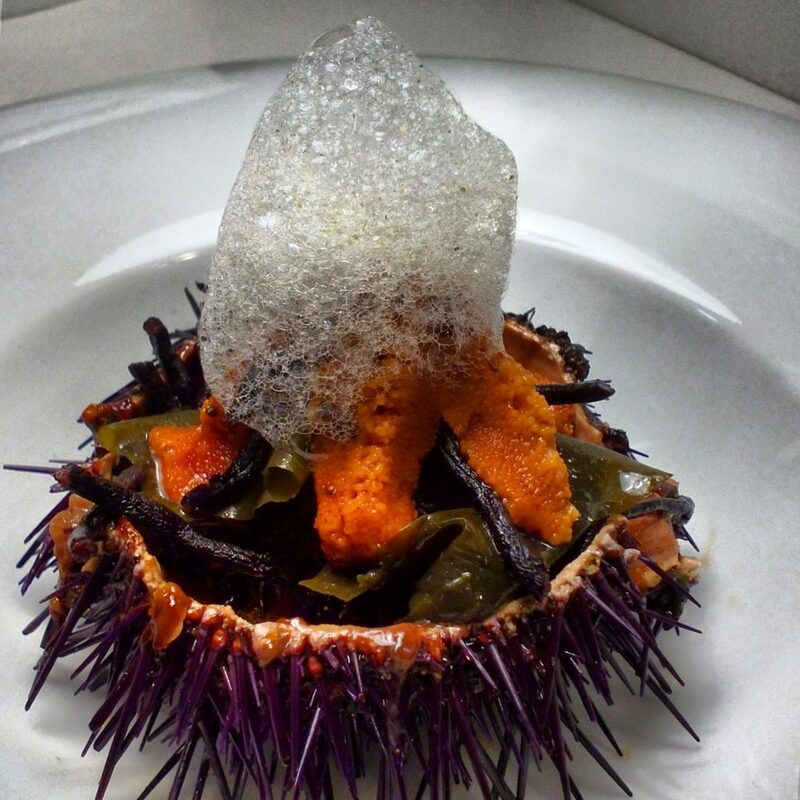 Today it’s time to talk about the Michelin starred restaurants in Catalonia with one star. 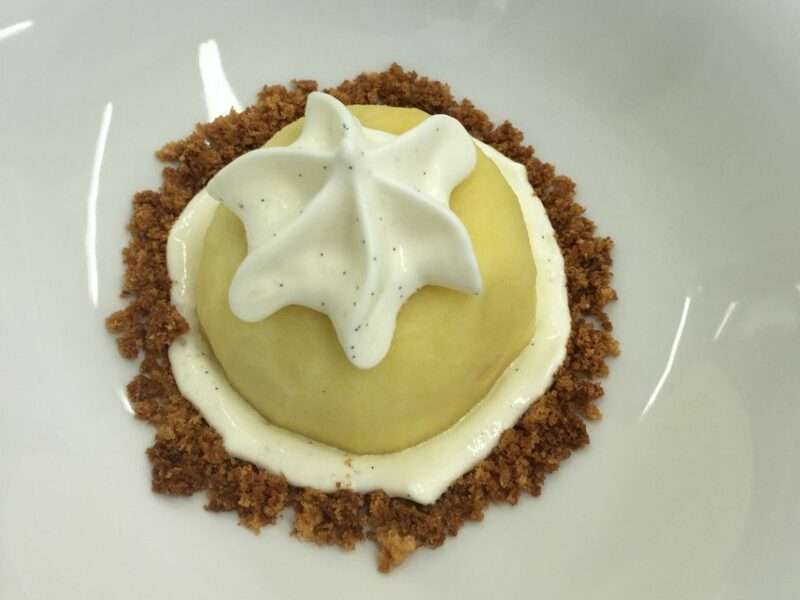 Recently we published an article about Michelin starred restaurants in Barcelona with one star to be your definitive guide of all the gastronomical wonders in the city. 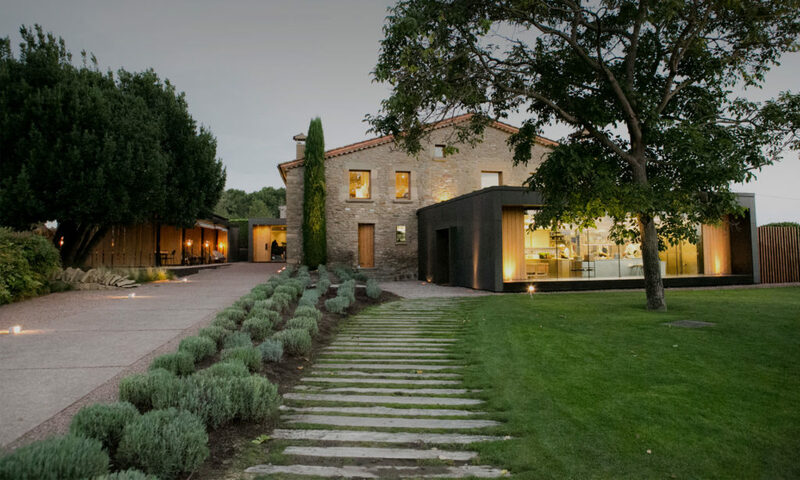 But Barcelona doesn’t have all the glory, there are even more one-star Michelin restaurants surrounding the city in Catalonia’s beautiful villages and countryside. 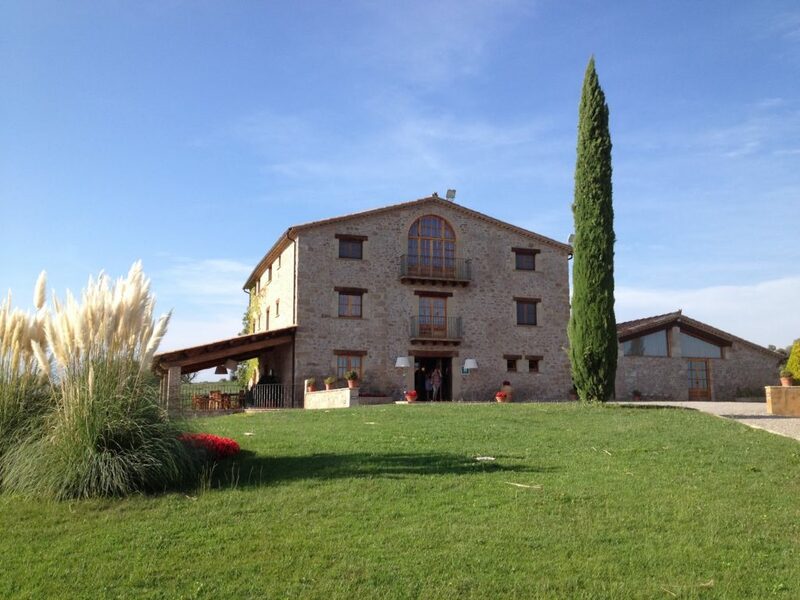 For a day or two away from the city, Els Casals is the perfect destination. 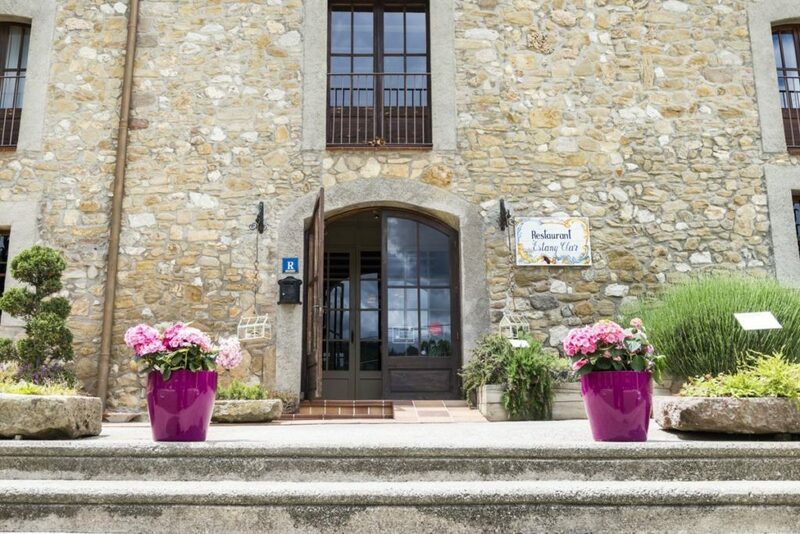 It is located outside Sagàs, a picturesque village nestled in the Pre-Pyrenees valley. The country house hotel/restaurant is situated on lush farm land and sprawling gardens. Els Casals is down to earth fine dining – all the ingredients come from the farm itself, or from families nearby (Tatjé‘s family’s pigeon, boneless and roasted orange duck from Bessa’s family). This gorgeous converted farmhouse is a scenic hour’s drive from Barcelona. The dining room is a romantic haven of stone walls and soft lighting. Their tasting menu samples a vast range of their culinary talents from Grandmother’s canneloni to sliced roast veal and foie, each garnished with a different herb. Venture an hour north of Barcelona to the foothills of the Pyrenees for a breath of fresh air. Fonda Sala has had its Michelin star for longer than most and its dining room reflects its timeless dedication to fine food and wine, free of any fads or pretension, but still at the forefront of innovative cuisine with dishes like sweet and sour wild rabbit. To the north of Barcelona, not far from the Montserrat monastery you can find L’Ó, a modern hotel/restaurant nestled amongst the medieval houses and churches that mark the area. The town in which L’Ò is situated, Sant Fruitós de Bages, has its own monastery and the food at this restaurant is indeed worthy of the gods; slow-cooked baby goat shoulder with mushrooms and truffle, and oyster with ponzu sauce, apple and codium. Another restaurant worth venturing out of Barcelona for, Santa Coloma de Gramenet is home to a Michelin-starred restaurant that offers the most affordable tasting menu (dinner Tuesday to Thursday and lunch Tuesday to Friday) at just 40€ per person. Dishes like solid mojito, Campari & orange stuffed olive and Mojito truffle signal a restaurant that is not afraid to experiment. In a converted farmhouse about an hour’s drive from Barcelona, Can Jubany offers a sumptuous choice of menus, from their own signature dishes (Catalan cured sausage ‘llonganissa’ and crispy pancetta), a gastronomic tour of Catalonia (pigeon rice with pork belly and sausage) and their sublime meal (Salad of red shrimps from Palamós with a thousand islands sauce ice cream). If you fancy a day on the coast, head to El Masnou, just past Badalona. It’s less than a 30 minute drive away and features seafood of the highest quality such as slow-cooked red tuna belly with potato cream and “allioli” of avocado, basil, spinach and sesame as well as Duck Royale with foie gras. It’s renowned for its vermut too, so be sure to start with the local aperitif or have a light lunch of burrata with pear and walnuts or steak tartar. Just plan a daytrip away from Barcelona and taste the best of the rest from Michelin’s one-star A-list in Catalonia! Barcelona does Christmas undeniably well. Whereas in many European cities, you are likely to have Christmas tat and poor Santa-imitations thrust upon you, the Catalans celebrate in style and yuletide joy is often accompanied by a range of delicious Catalan dishes and sweet treats. In Catalonia Christmas begins on 24th December and continues until Epiphany (Dia dels Tres Reis d’Orient) on 6th January when the presents arrive, providing ample time to fill your boots with some local culinary delights. On Christmas Eve, We celebrate El Tío de Nadal (a Christmas log which poos presents) and whilst there are no traditional Catalan dishes to mark the occasion, no self-respecting Catalan would celebrate without having stocked up on Neulas (Catalan biscuits usually eaten with Cava) and Turró (a sweet food found in a variety of guises but its most original form is similar to that of nougat). Be sure to pick up your own share of these tantalising treats in any of the Christmas markets dotted around Barcelona. 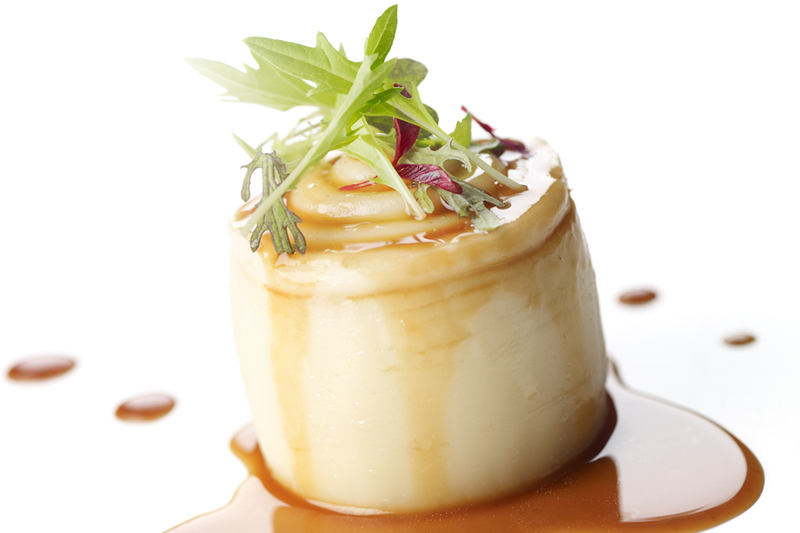 December 25th in Barcelona is one big gastronomic treat. Catalan dishes served on Christmas day include escudella i carn d’olla (a sensational soup comprised of lamb, pig´s ear or cheek, potatoes, chicken, butifarra or Catalan sausage and Galets, a kind of pasta with a shape of a shell) , followed by pollastre farcit (oven roasted chicken stuffed with seasonal chestnuts and sausage meat). 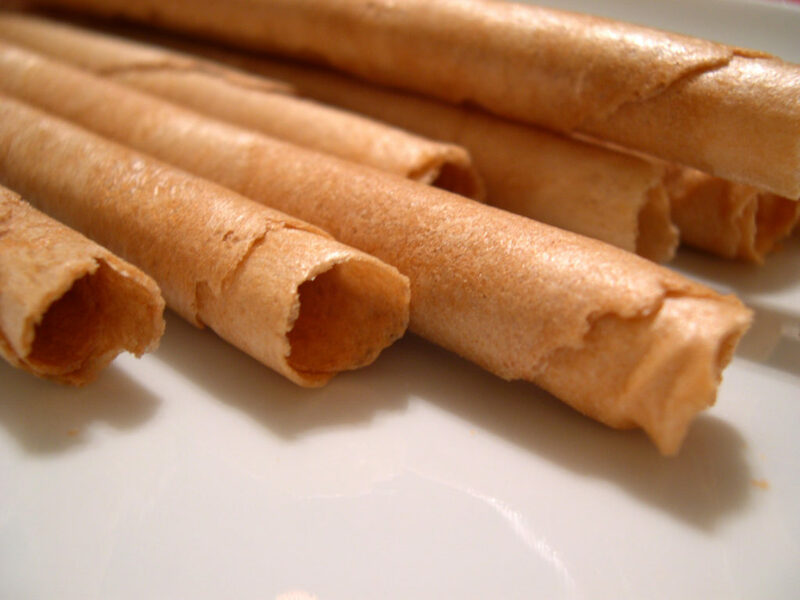 These Catalan dishes are washed down with Cava and sweet treats such as dried fruits and nuts, “Turrons” and “Neules”. You´ll also find giant Galets (pasta shells) along the streets of Barcelona in December which make great photo opportunities! 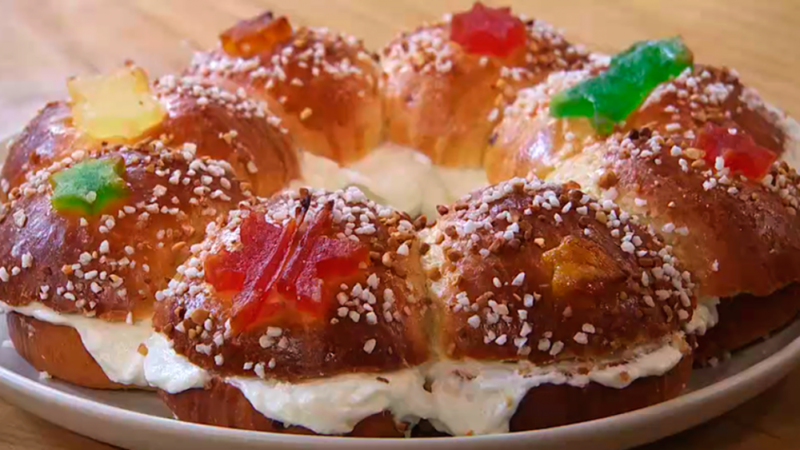 Celebrations continue on St Steven´s Day (26th December) with family gatherings and once again, the opportunity to extend the Christmas waistlines with leftovers from the day before used to make “canelons”. 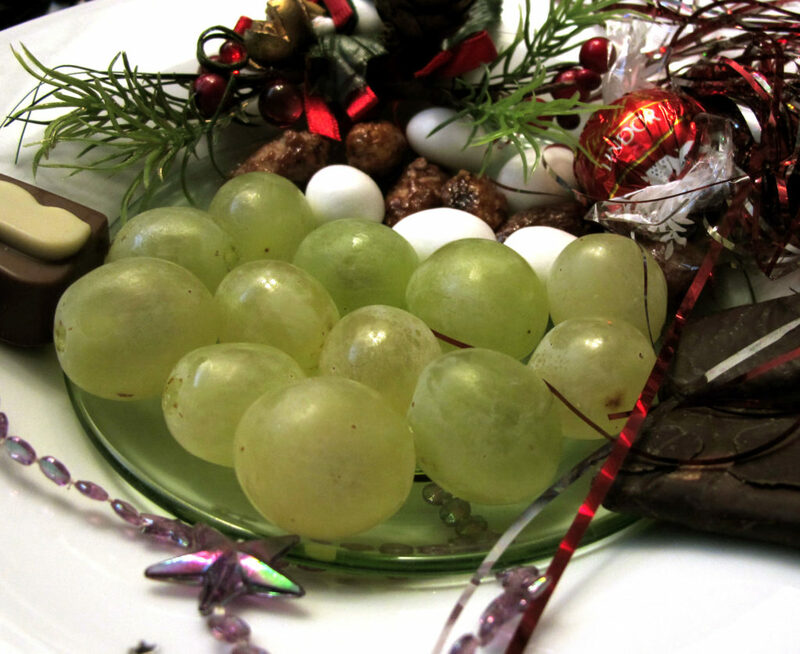 Celebrate New Years Eve like a true Catalan with the surprisingly-tricky-to-master grape countdown in which you pop one grape in your mouth for every clock chime. Considered to ensure good luck for the year ahead, make sure you you don´t miss out – you can even buy packs of 12 deseeded grapes for the occasion! There are many theories attached to this tradition, but the most common explanation arises from the over-production of grapes around 1900. New Years Day hangovers aren´t usually soothed by a particular Catalan dish but stuffed chicken often crops up on the menu. Finally, the 6th January (Dia de Reis) provides yet another perfect excuse to indulge with El Tortell de Reis. This colourful, O-shaped cake is usually stuffed with marzipan or cream and glazed with fruit and contains two hidden surprises: a figurine of one of the threee kings and a fava, or dried field bean (yes, you read correctly, a bean!). Whoever is lucky enough to find the king gets to wear a paper crown whereas the less fortunate finder of the bean has to pay for the cake! So, loosen the belt and prepare to indulge. Catalan Christmas cuisine won’t fail to disappoint! Cava is a champagne style sparkling wine made in Spain, and is known for being a more affordable choice for your celebratory occasions like New Year’s Eve and weddings. 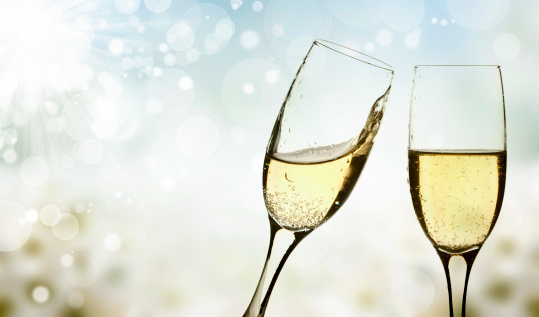 If you’re a fan of bubbly but have always wondered what the difference is between all these varieties like Champagne, Prosecco and Cava, we’re here to give you a little more information. Naturally, we will be highlighting our Spanish preference and trying to answer the pressing question, what is cava? Because, well, we’re biased. We can only do so, however, in light of the other varieties, so get ready for your annual wine lesson – something it’s good to study up on at least a little before visiting Catalonia. Cava is a simple aperitif made primarily from three Spanish grape varieties. It is neither as sweet as Italian Prosecco nor as nutty as Vintage Champagne, making it the perfect middle ground and crowd pleasing bubbly beverage to serve your guests. While it typically uses Spanish varieties of grapes rather than French varieties, Cava is produced in the traditional French Champagne method. What makes Cava different, essentially, is that it is made in Spain with Spanish Grapes. What sets sparkling wines apart from their counterparts is all in the bottling process, which is when the bubbles are formed. After being bottled, cava wine continues to ferment for months or even years. The bottles are capped with crown caps (like those used for beer bottles), and slanted down to allow all the yeast to settle in the neck of the bottle where the pressure will build up the most. After fermentation the tip of the bottle is then submerged in a freezing solution and a few inches of it are turned to ice, at which point the cap is removed, and the pressure in the bottle will actually expel the ice plug that has formed. The vintner will then top the bottle off and cork it. Finally, you probably want to know what all the different types of Cava are in your quest, asking questions such as “what is cava brut?” There are three types of Cava, all of which are made with a blend of the three main grapes used in cava production, which are Macabeu, Parellada, and Xarel-lo, all of which are white varieties. Brut and Brut Nature Cava is a fruity style that has become popular because it is lower in calories than the other styles. It is fruitier also, making it the perfect aperitif. Cava Rosé is, of course, pink, meaning that vintners add other grapes into the mix to get this color, which is most likely the Spanish Garnacha and Monastrell varieties. Pinot Noir is also becoming a common addition. Finally Vintage and Aged Cava is more in line with the original French Champagnes and is known for having a more nutty and toasty flavor with zesty aromatics like apple and almond. Now you are ready for your cava drinking experience here in Barcelona, which you’re sure to find at any cocktail hour or included in many a sangria recipe. You can either be spared having to ask your bartender, “What is cava champagne?” or you can boldly ask away and learn even more! Catalunya has long been known for its cuisine, but until you’ve gone and eaten your way through Barcelona you won’t quite understand just how ingrained food is into this independent Spanish region’s daily life and priorities. 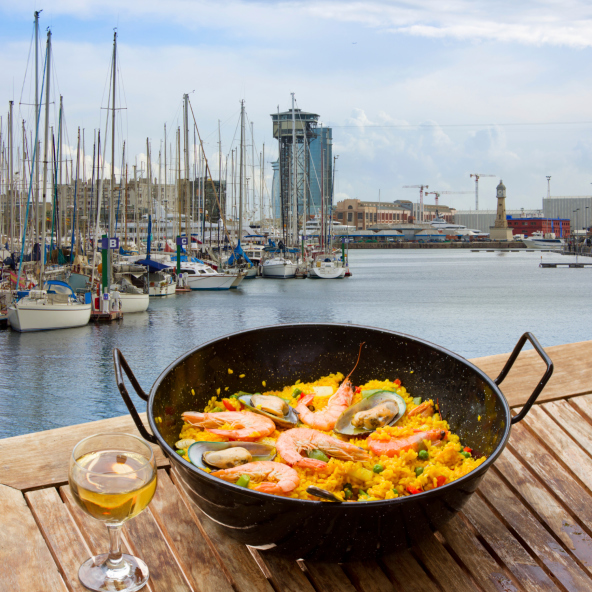 There is much more to Catalan cuisine than giant paella pans full of fishy goodness, or tapas bars with a million bite-sized options to choose from – though both of these could probably keep you occupied for your entire stay. Much more than just the unique tastes, smells, and textures, experiencing Catalan cuisine is as much about the ambiance of time, place, and form. There’s really no way to miss out on authentic Catalan cuisine moments while visiting as the locals take their food and dining seriously. Here are some ways to enjoy Catalan cuisine. 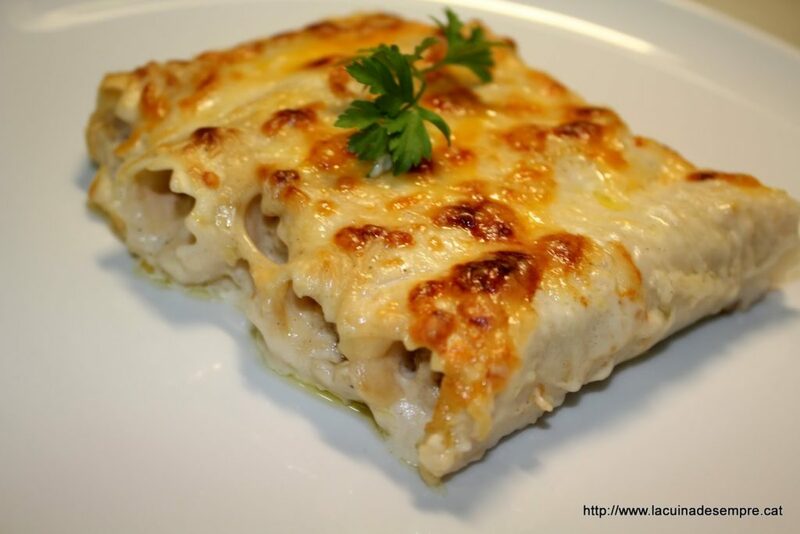 A Catalan cuisine all their own, tapas are as much a style of eating as they are a style of food. Offering two or three-bite snacks in different shapes, sizes and colors, any of Barcelona’s tapas restaurants promise an explosion of different flavors that there’s simply no way to prepare for. Another wonderful thing about tapas is that they are an inherently social food. Made for sharing, lingering over, and to accompany carafes of wine or bottles of beer, locals will typically spend hours at a restaurant chatting and nibbling late into the night. Being that Barcelona is right on the beautiful Mediterranean sea – yes it is actually a beach town within a metropolitan city! – there is very little chance that you’ll miss the opportunity to munch something fresh off the boat. 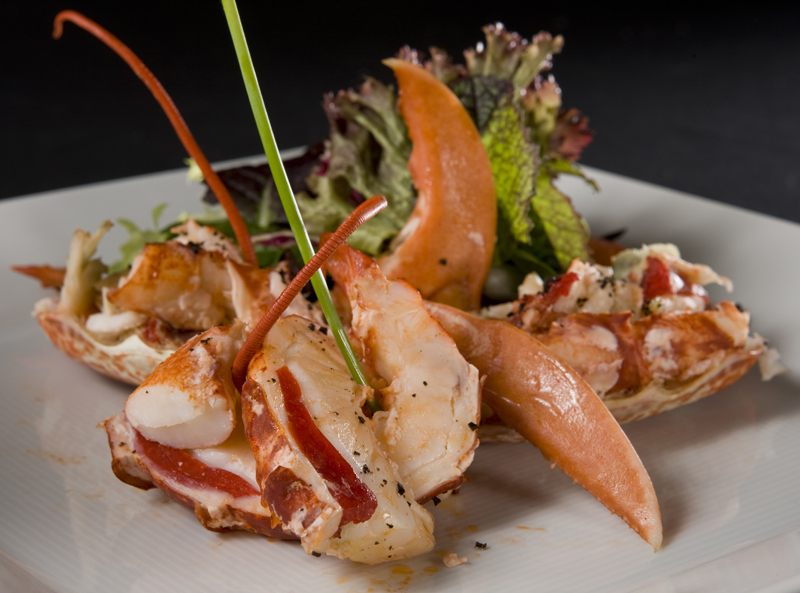 If you’re not a huge fan of seafood, try a little nibble when out for tapas. If you love seafood then go to virtually any Catalan cuisine restaurant and sit down to order either paella or another local dish, esqueixada, which is salted cod with tomato and onion. If you’ve traveled around Europe before, assuming you aren’t from there, you already have an understanding for the fact that they do food and shopping a little differently. If you’re staying in a flat in the city and need provisions for the week, there is no better place to go than one of the city’s famous markets. La Boqueria and Santa Caterina Market both offer photo worthy displays of everything fresh. 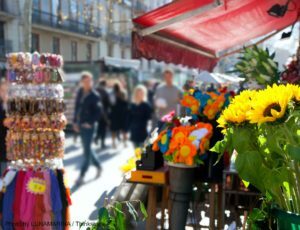 The Mediterranean climate promises year-round fresh produce, so prepare to be spoiled, and don’t be afraid to make a trip to the market a daily habit while visiting the city. That’s how the locals do it! If you like to nerd out about food science, then you don’t want to miss the chance to tour one of the local wineries or dairies. Wine and cheese are staples in Catalan cuisine, and not only will tours afford you the opportunity to learn more about them culturally and historically, but you’ll certainly have a chance to taste some real rarities. Catalan cuisine is one of the best parts of visiting Barcelona. Cooking classes, eating with the locals and visiting a famous restaurant are other wonderful ways to fill out your meal time here in the city. No matter how you choose to line up your foodie experience, you won’t be disappointed!